The 19 global and regional powers who have gathered in Vienna have agreed to work towards setting up a nationwide ceasefire in Syria, according to the joint statement. "One of the most important agreements of today's meeting is that the talks’ participants are asking the UN to gather representatives of the Syrian government and the opposition to begin the political process," Lavrov told a press-conference in Vienna. This political process should provide for all sides to create "an inclusive structure" that will help to prepare a new constitution and hold elections that should be controlled by the UN. All Syrian nationals should be able to take part in the elections, including refugees in other countries, the top Russian diplomat stressed. Terrorists must not be given a chance to seize power in the country, Russian FM Sergey Lavrov said during a press conference, adding that this understanding is shared by all 19 parties attending the talks. "We have a common enemy, and we must not let this enemy gain power neither in Syria nor in any other state," Lavrov said. 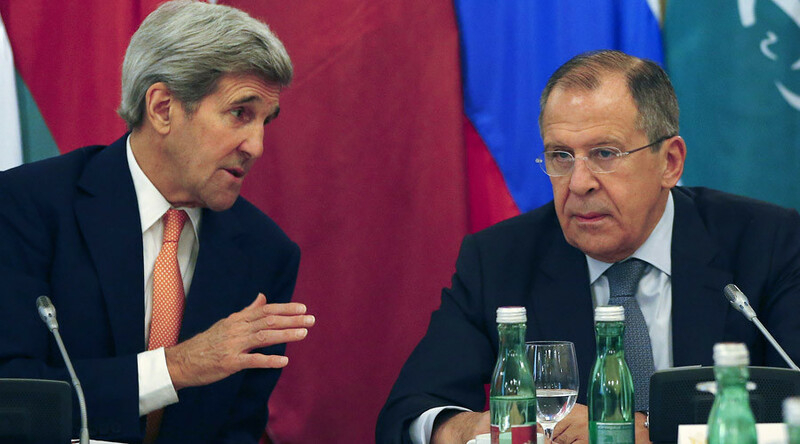 "If a ceasefire is declared, no terrorist organizations should be subjected to it," Russia's Foreign Minister said. A comprehensive list of terror groups operating in Syria will be defined during a separate meeting. Participants of the Vienna talks agreed on the necessity to work on a new constitution in Syria, and to hold elections that should be administered by the UN, Lavrov said. State institutions are to remain intact. "Russia remains firm on its position that fighting terrorism should be conducted in accordance with the solid basis of international law, whether we are talking about military interventions from air or ground operations, these need to be conducted in agreement with the government or with the UN Security Council," Lavrov said. Meanwhile, the truce is to be followed by the formation of a transitional government. Earlier reports said that the ceasefire should be achieved within four to six months, but the Russian FM did not confirm the timetable. The UN is calling for all the countries that have influence on the Syrian government and opposition to try and put them at a negotiating table, the United Nations' special envoy for Syria, Staffan de Mistura said. Humanitarian access should be provided to all territories in Syria, and help to refugees intensified, the talks’ participants pointed out. The fate of Bashar Assad remained a stumbling block throughout the seven hour meeting. The US and its allies including Saudi Arabia believe that the Syrian president, whose term expires in 2021, must resign. "There is no way President Assad can unite and govern Syria," US Secretary of State John Kerry said, adding that "Syrians deserve a different choice." "We can't allow that difference [in views on Assad's fate] to get in the way of the possibility of diplomacy to end the killing and find a solution," the US official said. But added: "Make no mistake: the answer to the Syrian civil war is not found in the military alliance with Assad in our point of view." Kerry also told the journalists that US is employing a two-part approach in Syria: intensifying the counter-terror campaign and "intensifying our diplomatic efforts in order to end the conflict," adding that both steps are "mutually reinforcing." US troops will be deployed in northern Syria, Kerry said in Vienna. They "will help to coordinate local ground forces and coalition efforts" in the region. He said that the announcement of Obama's decision to deploy more military forces in the country during talks on peace efforts is "a coincidence," adding that the US is "very proud" of what has already been achieved in Iraq and Syria. The US and its allies do not demand the immediate resignation as a precondition for peace process anymore, saying Assad can stay in power for months during the period of transition, but insist he must step down when it draws to a close. At the same time, Russia's Lavrov again stressed that it is up to the Syrian people to make such decisions. "The Syrian people should define the future of their country... including Assad's fate," Russia's FM added. As the meeting in Vienna wrapped up it remained unclear how truce and the transitional period are going to be implemented, how long the latter will last, and whether the parties in the Syrian conflict are ready to accept it - as neither Damascus nor the opposition took part in the negotiations. The next round of Vienna talks is scheduled to take place in two weeks. The civil war has been going on in Syria since 2011, when violent protests erupted as part of the so-called Arab spring. Having seized the vacuum of power, terrorist organization Islamic State (IS, formerly ISIL/ISIS) managed to capture huge territories in Syria and Iraq. On September 30 this year, Russia started a military operation against IS and other terrorist groups in Syria. The US-led coalition has also been fighting terrorists in the region for over a year. Vienna meeting participants: Russia, the US, Saudi Arabia, Turkey, Iraq, Italy, Egypt, Great Britain, Germany, Lebanon, Qatar, Iran, France, China, the UAE, Jordan, Oman, the EU and the UN.